Some private collectors are open about their purchases, others not. Some have lended their most exclusive books for exhibitions, others keep them in a room, which even their intimates (if any) are forbidden to enter. There are collectors who have become famous during their life time, others disappear without a trace. In New York, Sotheby's will sell the library of Jacques Levy on 20 April. The catalogue explains that this will be the first time that the collection can be seen by the public. Levy died more than 30 years ago, in 1980. He was born in Istanbul in 1905 - he shared the dates but possibly not the ideas of Jean-Paul Sartre. Levy was 'educated in French schools', lived in New York, but travelled in Europe and South America. His eclectic collection was started in the 1940s. In 1948, for example, he acquired a copy of Oscar Wilde's The importance of being Earnest; this was one of only twelve copies on Japanese paper, bound in full vellum, with the author's dedication to Robert Ross. 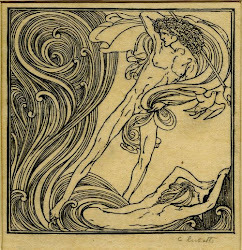 Longus, Daphnis and Chloe, illustrated by Charles Ricketts and Charles Shannon. London, The Bodley Head, 1893, p. 60-61. Somewhere along the line he acquired an extraordinary copy of Ricketts' and Shannon's early masterpiece, Daphnis and Chloe, which was published for the artists by Mathews and Lane at the Bodley Head in June 1893. There are a few copies, in which Thomas Sturge Moore later ascribed the design of the individual wood-engravings to either Ricketts or Shannon. The Levy copy also has marginal pencilled notes to identify the artists, who divided between them the design of the illustrations, which were subsequently drawn on the wood by Ricketts and cut by Shannon. It took them about eleven months to finish the job. The Levy copy has some unique selling points: the book is accompanied by a set of 27 proof impressions of the wood-engravings (on 26 sheets), 14 are signed by Ricketts, 10 by Shannon, and 2 sheets are signed 'C.H. Shannon & CR'. The provenance of this copy is known, as it was once owned by the New York banker and collector Joseph Manuel Andreini (1850-1932). Andreini was a member of the Grolier and Rowfant Clubs and one of his bookplates was designed by Lucien Pissarro whose Eragny Press books he bought at the time they appeared. He also collected Vale Press books, such as the volumes containing Chatterton's poems and Tennyson's lyric poems. Before Andreini took hold of the copy, however, it was given by the artists to one of their publishers, (Charles) Elkin Mathews (1851-1921). The Levy copy has been inscribed on the front free endpaper by Shannon: 'To C Elkin Mathews May 19th 1893', and the inscription is also signed by Ricketts. Sturge Moore (to whom the book had been dedicated) also signed this copy. The dedication is dated almost three weeks prior to the publication date. Who will be the next owner?